This topic contains 4 replies, has 2 voices, and was last updated by Billy 4 years, 1 month ago. Shopping hasn’t always been as dire as it is today in Wolverhampton. And talking of Happiday’s do you remember where they where!. 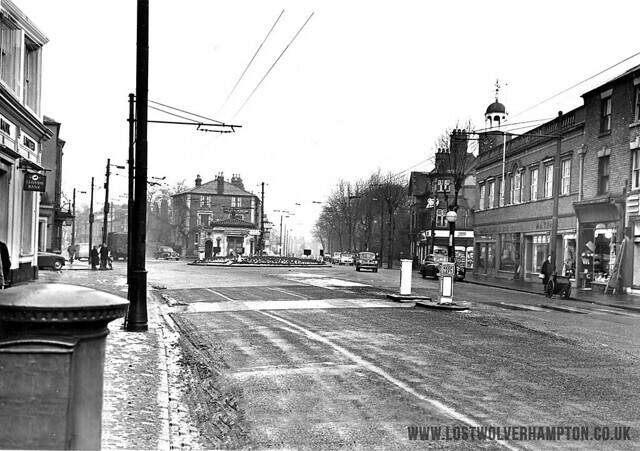 It doesn’t look like there are many people who recall “Happidays” in Wolverhampton But perhaps by the time we get a few more interested Quiz followers here on Puzzle corner they may have returned. 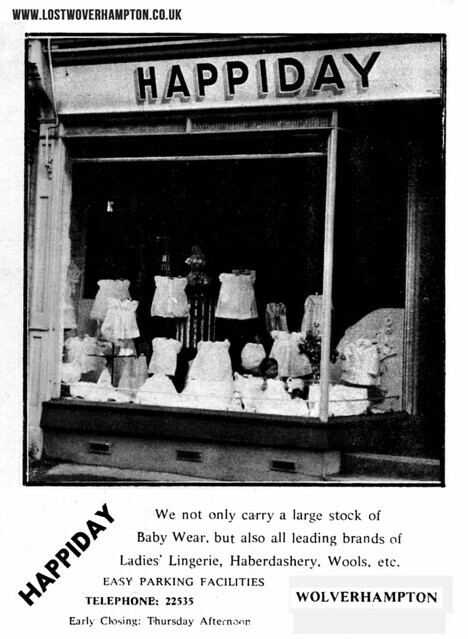 Happidays Baby Linen Dealers came to Meadow Street off Chapel Ash in the late 1950’s about the same time as this photo was taken showing a flourishing shopping area at that time. The clock on the tower of Charles Clarkes on the corner of Bath Road, reads ten past ten and next door F.C.Goodhall greengrocers is open for business. Great photograph, but you failed to mention the window cleaner. His barrows there and the ground floor ladders there, the pointed one, but the he’s missing. Drinking Tae at the Green Grocers? Move up again; add two more wheels and a horse, some goldfish and you would be a rag and bone man, a 1940’s Del Boy. Perhaps a mobile Green Grocer, a set of scales on the back of the cart and you were in business. Like to get your hands dirty, sell coal, you didn’t need a yard, go down to the “cut”, fill up the cart, straight off the barge and at the end of the day you tie the horse to the end of the bed and you were on the way to your first million. If you couldn’t afford wheels, a coke brazier, to sit in front of, a night watchman, guarding a hole in the road. Must have worked, I never heard of one being stolen, although really you were there to see the Council Paraffin Lamps never went out. The Apprentice? They haven’t got a clue. The material you can glean from a photograph is amazing George I thought you may have mentioned Fred Goodhall you being in the trade at one time. But such interesting observations although the old timers who can recall those callers such as us two are getting very thin on the ground now. Incidentley the chap who had the Chapel Ash window cleaning round in the 1980’s was Bill (?) from Pattingham and his absence from the scene was that he is probably on his second pint of Banks’s in the Clarendon.